The logo is by Graphfreak and may be modified for future release as the artist works with the web team to tweak the design. This also means that official artwork, such as splash screens will be coming out soon! – “Not found” message now shows when you search for something in CCSM and it doesn’t exist. – Profile adding now works again. – Fixed the tab-bar being drawn one slot too thin occasionally. 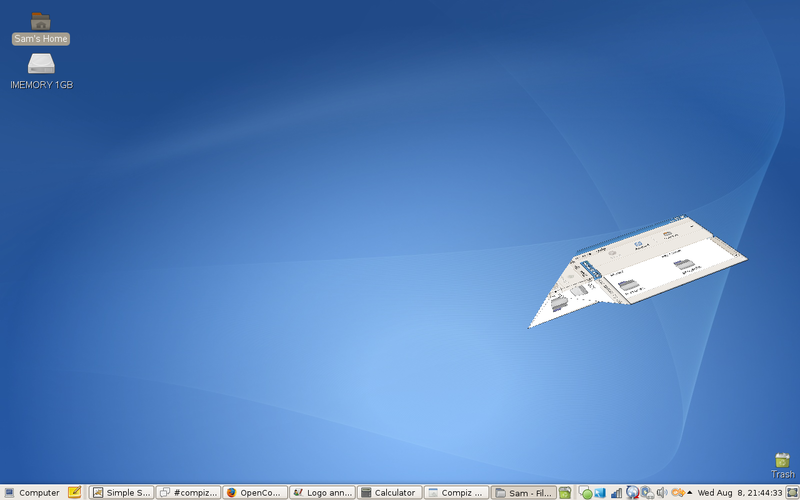 Airplane : Folds your windows up into a paper plane and files the off into the distance, or to the taskbar. Fold : Folds your windows up into … nothing! Very simple! Skewer : Ah yes, my favorite. This animation divides your windows into parts and allows you to have the parts fly in and out and tesselate together any way you want! This plugin is so customisable that I just _had_ to include lots of screenshots! And finally a video I found on YouTube. – The wall’s switcher windows’ colors can now be further configurated, from the arrow, the outline and to the desktop highlight. 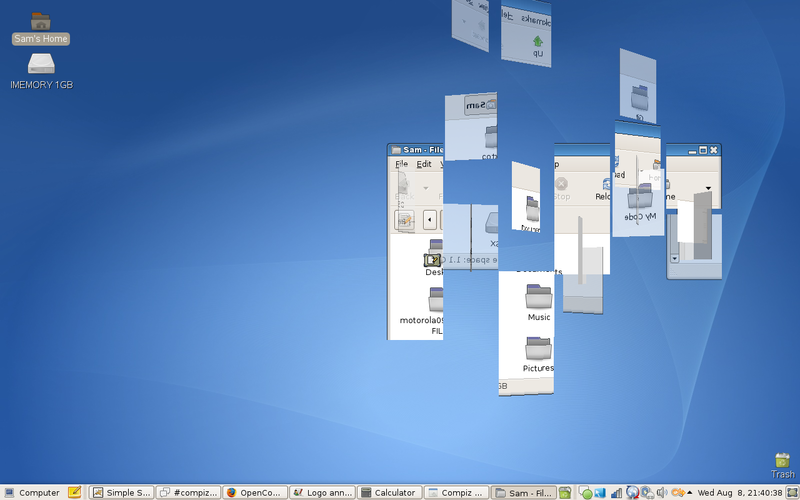 – XCB dependency added to compiz. Unfortunately that means that compiz-git will no longer build, because it requires something that most distributions don’t actually have (Confirmed distros : Fedora, Ubuntu, Debian). You will have to use version 0.5.2, or the 0.6 git branch of compiz. – Profiles are now stored in ~/.config/compiz/compizconfig instead of ~./compizconfig. If you were wondering where your profiles went, move them from the old folder to the new one. The winning logo, ‘Graphfreak’ received 287 votes in total, counting for about 48% of all votes cast. This also implies that we will now have artwork for various things such as icons, forum themes, cubecaps, splashes and website themes. *Beep* *Beep* *Beep*. Man, don’t you just hate that loud *Beep* sound when an application triggers the system bell, like if you backspace too much in a terminal? Fear not! As I have a more *subtle* solution for you. First of all, you want to disable the annoying beep. To do that, go into CCSM, and filter out for ‘Core options’ and uncheck ‘Audible Bell.’ Now that *beep* is gone! Now, for a subtler visual bell, go to the ‘fade’ plugin and check ‘Visual Bell.’ Now when you do something that causes a ‘bell’ event, the window will darken and brighten again. Neat. Thats all for now guys. Sorry about writing the blog a bit late, I’ve been rather busy with assignments and exams, let alone some of the stuff I’ve been doing round here recently. From now on, I’d expect the blog on a wednesday, because If I wrote it one monday, there would not be enough to write about! Anyways, if you have any questions, then leave a note in the comments. Also, if your comments haven’t appeared yet, then don’t panic! Stupid WordPress seems to want me to moderate them. And I don’t do that very often. Mention goes to anyone who can tell me how to automatically pass all comments not caught as akismet spam. Compiz Core 0.5.2 is out! It’s a shame though that the animations configurator is WAY to complicated for anybody to use it anymore. – uncollapse the bindings tree and on the line that says “shiver”, check “system bell” (the last checkbox). I’d also like to complain at this stage as to why the setting for the shiver visual bell and the fade visual bell are so different – the shiver visual bell is in fact almost hidden! don’t know what happened to that idea…. hey smspillaz, I just want to thank you once for that blog – it is really a great pleasure to read through it and it keeps me on the top of the news concerning Compiz-Fusion. I read the forum also regulary, but i’m not anymore one the top (IRC etc) so your blog is just perfect. Compiz Fusion compiles if you grab the libx11-xcb package from experimental. It’s not pretty, but it works! What desktop them is being used in the video? It looks nice. I don’t know, seems sort of pointless. I could see it being neat for maybe a day. I really like the logos though. will this version let me play mplayer at full screen with no transparency? if not, I’m not getting it. Pingback: Compiz Fusion Prepares for the Limelight « Software Battle! The logo choice looks fine but I fear it will date quickly – already quite reminiscent of Macromedia branding from some years ago. The luminous light-filled cube that was entered was a classier and more time-robust design I think. The luminous light-filled cube that was entered was a classier and more time-robust design I think..
Maybe Linux developers should focus on getting some proper GUI standards and work on usability before they consintrate on their “my OS is better than yours because I can turn my desktop into a cube” attention-whore wankery. GNU/Linux has a lot of potential. And it’s squandered so fanboys have something pointless to drool over. Linux needs STANDARDS both in usability and interoperability. very nice 😉 Can some one write howto make themes for this?? Pingback: Compiz-Fusion: Novo Logo e Novos Plugins. 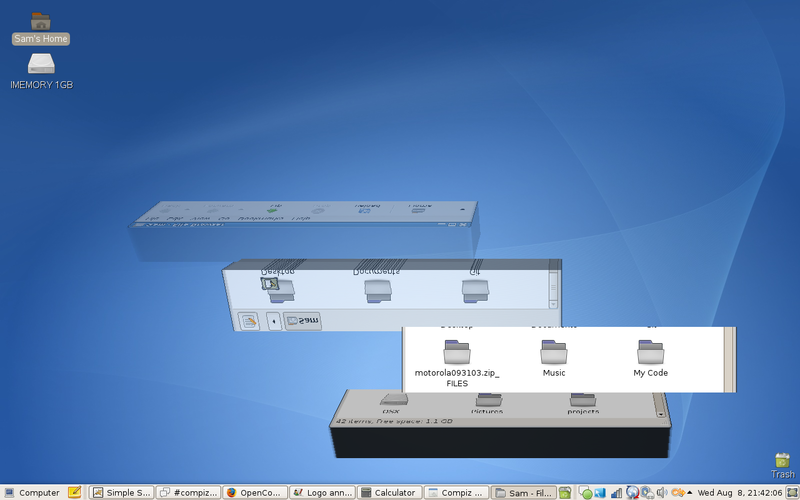 Pingback: Universe_JDJ’s Blog » Compiz Fusion: new logo, new animations, and a first release coming up! I agree with Pifman’s review. Is it really any use to the user? cant wiat till i get back from holiday! BTW I like the logo! 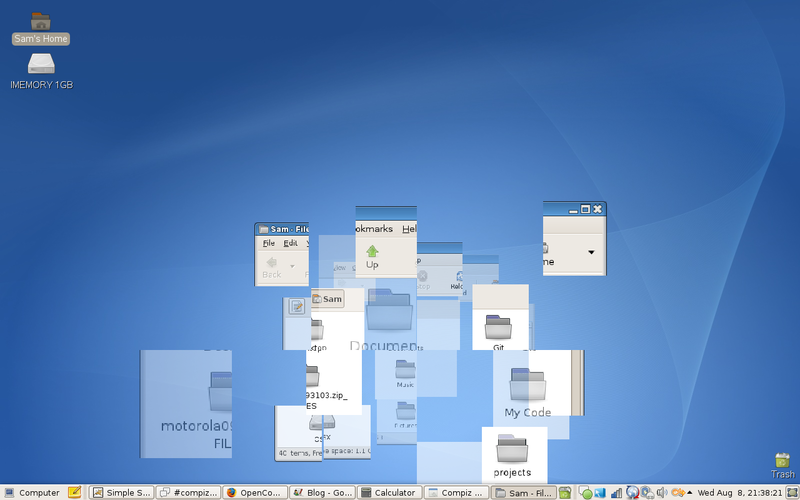 … and speaking of usability, it is hard to understand your point as compiz adds lots of usability enhancements. You can disable all those eye-candy and effects things and leave extremely powerful usability features. Hmm… Have you actually tried compiz? To go with what Oded said, and the fact that configuration on Beryl was insane, and I assume with all the new features CF is likely to be if not as insane, more so, why not have “visual bell” just be its own section instead of hunting it down within the other plugins? WT Snacks, there ARE standards. Both GNOME and KDE have usability experts on-staff (I personally know a KDE usability expert). GNOME has its “Human Interface Guidelines,” and I know KDE has something similar. All *official* programs for the two Desktop Environments must follow their set usability guidelines. Less-intuitive user interfaces are usually found in random programs that are not “governed” by anybody. 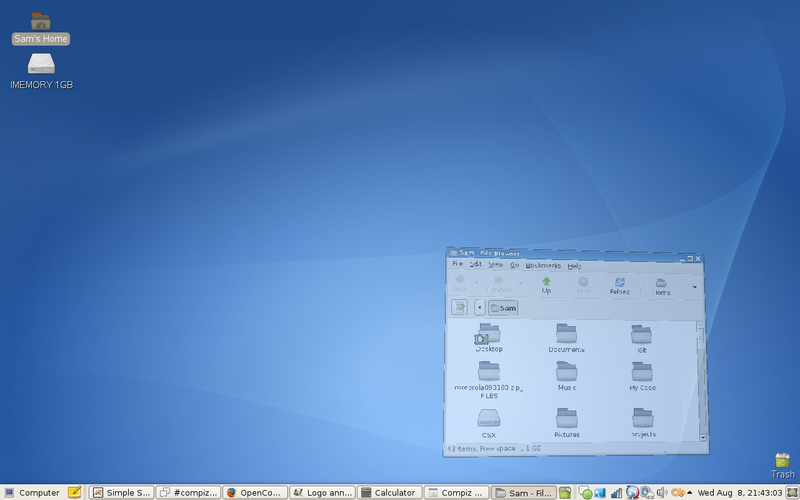 The user interfaces in GNOME, XFCE, and KDE are very nice, though I prefer GNOME. If there is something which you think poses a problem in GNOME or KDE, why don’t you email one of their developers and voice your concerns? As it is though, I’ve seen much more cringe-worthy UIs on websites (images of text can not be read by screen-readers, for example, and Flash falls into that category) than in any Linux software. Pingback: Compiz Fusion, unificando una joya en zoomagazine.org | digitaliza! looks great, i love it!! can´t wait for the 1.0 release. Pingback: Rich on Linux, OSS and other stuff » Compiz-fusion 0.5.2 now available! Want to start your private office arms race right now? I just got my own USB rocket launcher 🙂 Awsome thing. Plug into your computer and you got a remote controlled office missile launcher with 360 degrees horizontal and 45 degree vertival rotation with a range of more than 6 meters – which gives you a coverage of 113 square meters round your workplace. Check out the video they have on the page. 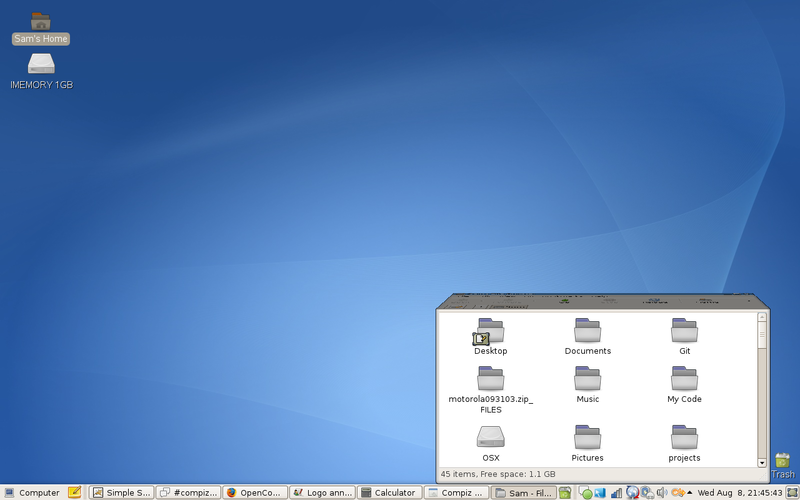 Pingback: Top Linux News » Blog Archive » Compiz Fusion: new logo, new animations, and a first release coming up! Pingback: Compiz Fusion Prepares for the Limelight | Software Battle! Pingback: Sonereker Blog » Blog Archive » Compiz Fusion: new logo, new animations, and a first release coming up! Thanks for the info! I love Fusion and think the new logos are awesome. Replica watches…cool..i always love the idea of buying replica stuff!!! Breitling replica watches…..very reasonable and close to original..wow!!! If you are doing research, use the internet to find a debt consolidation company. This is also a place where you can easily compare deals. It can save your time and effort. A debt consolidation loan has many advantages. It can reduce high interest rates and simplify monthly payments by reducing them to one. However, individuals must do their part by learning to spend wisely and responsibly. Debt consolidation loans have some drawbacks as well. They can be seen by some lenders as a warning sign that a prospective borrower is in trouble. Another drawback is that some debt consolidation lenders will ask that you put up collateral before they grant the loan. louis vuittonlouis vuitton provide comfort and convenience without compromising your style. all luxury handbag of the materials are exactly the same as the genuine and all the products are produced with elaborate technique. .
Хороший сайт http://automend.ru/ – Клапан ABS соленоидный, схема уаз 39094, замена ламп infiniti, схема генератора уаз.как проверить, ремонт генераторов chevrolet и многое другое. Хороший сайт http://sexpornotube.ru/ – смотреть порно видео онлайн, порно инцест, порно, инцест и многое другое. the scalp of icon Pacquiao has overcome his objectivity. a direct result of their site memberships is very low – probably less than 10%. Be prepared to go on a series of good and bad dates before finding a potential mate. Not everybody can afford to splurge their hard-earned money on a Louis Vuitton or a Gucci handbag. fate didn’t happened earlier! I bookmarked it. blog platform are you using for this website? I’m getting sick and tired of WordPress because I’ve had problems with hackers and I’m looking at alternatives for another platform. I would be fantastic if you could point me in the direction of a good platform. website is in the very same area of interest as yours and my users would truly benefit from some of the information you present here. Ежегодно порноиндустрия приносит рядовому пользователю изрядно десятков тысяч порно фильмов. Станет очевидно, который без сильного спроса индустрия порно пришла желание в упадок. Непременно, придумать сколько то революционное и интересное для разбалованных фанатов непомерно сложно, в тоже период для этого предусмотренна целая воинство режисеров и постановщиков которые пытаются исполнить самый успешный фильм. Диковина порно индустрии в часть, сколько порно фильмы не увидишь в кинотеатре, их можно увидеть только в доме, будь то компьютер либо телевизор. Не стоит списывать так же и кабельное телевидение, которое без остановки крутят порно фильмы. Высокая борьба порноиндустрия подразумевает и наличие любителей, есть даже такое подраздел любительское порно. В котором, как начало, молодые ребята стараются заявить о себе и заработать небольшие деньжонки, разбавив многолетие новыми ощущениями. С домашнего порно начинают большенство порно актеры. Снявшись, будучи студентами, они становятся заложнками ситуации. Отточеная вид и аппетитные формы остаются в памяти многих, как постановление за счет успеха их постоянный основание уже не довольно такой как прежде роли в порно: появляются фанаты, плюс и близкие начинают смотреть по другому.